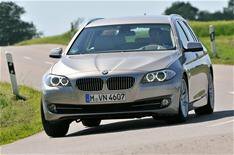 BMW 5 Series updates | What Car? The recently launched 5 Series gets some attention in Paris, with the addition of some new diesel and petrol engines. The two new diesels for the saloon and Touring models include the 3.0-litre 525d with 201bhp, and the 3.0-litre 535d with 295bhp. Petrol fans can opt for the 528i, which produces 255bhp. BMW has also unveiled all-wheel-drive xDrive versions of the 5 Series, but there are no plans to bring them to the UK.